Hello! I don't normally post personal stuff on my blog unless it relates to a travel or artistic story. My Facebook page is where I usually share personal or family photos and updates. But this Thanksgiving was one of the best I ever remember having, and I just wanted to share it. Plus, some paper crafting and decorating is involved, so it counts for my 'Creative Pursuits'. I don't really know what it was about this Thanksgiving that made it so special. It was just me and my nuclear family alone together, but I think we just all felt so BLESSED to have each other and to be able to spend some quality time together, that it the whole day was just wonderful. My dear, sweet children and husband decorated the room and adorned the table with presents and flowers for my birthday. Ashley and Jordan (my kids) went into town and purchased fresh flowers while I was at work. Ashley made sure to get colors that would match the colors in the room. Then Ashley made a birthday banner (using items from my stash in my craft room), and decorated a plain brown bag with scrapbook paper to wrap my present in. Here is a close up of the banner. Ashley said she hand traced the letters, because she couldn't figure out how to use my Cricut Expression and she didn't want to break it. And here I am, anxiously waiting to eat. 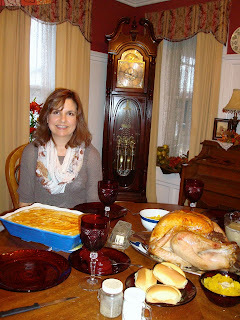 We had just the basic Thanksgiving food: turkey, stuffing, mashed potatoes, rolls, corn, squash, pumpkin and pecan pie. I bought the pies from a local restaurant, because I really don't like to make pies. I just like to eat them! And for those who read my' Fashion Over Fifty Posts' and want to know what I wore on Thanksgiving Day, I had on a pair of dark skinny jeans, a tank top with a mesh sweater over top, and an infinity scarf. Since I would be cooking most of the day, I was afraid I'd get warm, so I dressed in layers. But because it was so cold outside, I was actually more chilled than hot. Here is my wonderful, wonderful family: The old man with his eyes closed (he never takes a good picture! LOL!) is my sweet husband. The handsome guy with the beard is my son Jordan. His school has a thing going on right now called 'No Shave November', so he has been actively participating if you couldn't already tell. And the beautiful couple on the right are my wonderful son-in-law Jason and my precious daughter Ashley. After prayers of Thanksgiving to God for all His goodness, and a wonderful meal and fellowship, we all went into the sitting room to open my presents. The first present is from my husband. 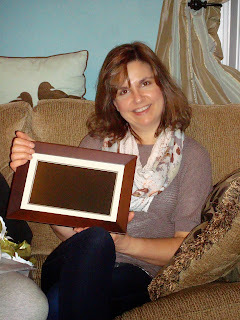 He gave me a digital frame. I told him that it was the best gift he ever gave me, and when I said that, I don't know who was happier, me or him. He was just so happy that he got something that I actually liked! He always struggles shopping for me. Now most of you are probably wondering 'what's so special about a digital frame?'. WELL, I love gifts that are personal. When someone actually takes the time to think about what means something to someone and express that in a gift. I don't care if the gift cost a few pennies or a million pennies….for me, it's the thought that counts. And my husband has always failed miserably in that department before! But this time, he hit it out of the ballpark! You see, I love to take pictures, and I always struggle with what photos to put in frames and display, because I love them all. So I have pictures all over my house, on every wall, every table, and often three or more clumped together. With this digital frame, you load all your pictures right into the component, and it displays them all…like a constant slide show! It's amazing! I love it! Now my only problem is, I can't stop watching my pictures! 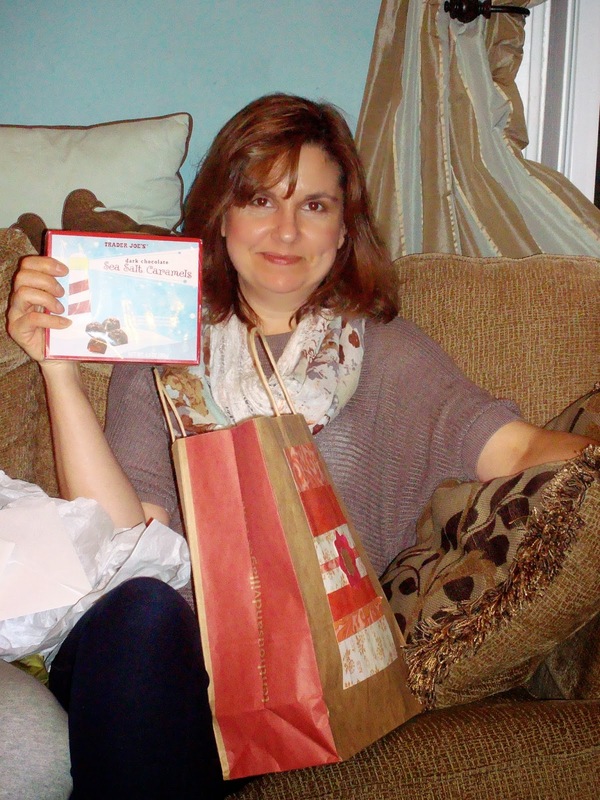 My daughter and son-in-law gave me a delicious box of Trader Joes Dark Chocolate Sea Salt Caramels and…..
the Broadway soundtrack to the musical 'Once' and the movie DVD. My daughter and I are huge Broadway lovers and we always try to see the latest shows together when we can. It was a very thoughtful gift because this is a new show that I mentioned to Ashley that I wanted to see when it came to Chicago or Minneapolis. So Ashley got the soundtrack for us to become familiar with the music before we saw the show. She figured we could listen to the music together in the long car ride to Florida we will be taking in a few weeks. Smart girl! And finally, after our bellies are full and the presents were opened, we just sat and talked. 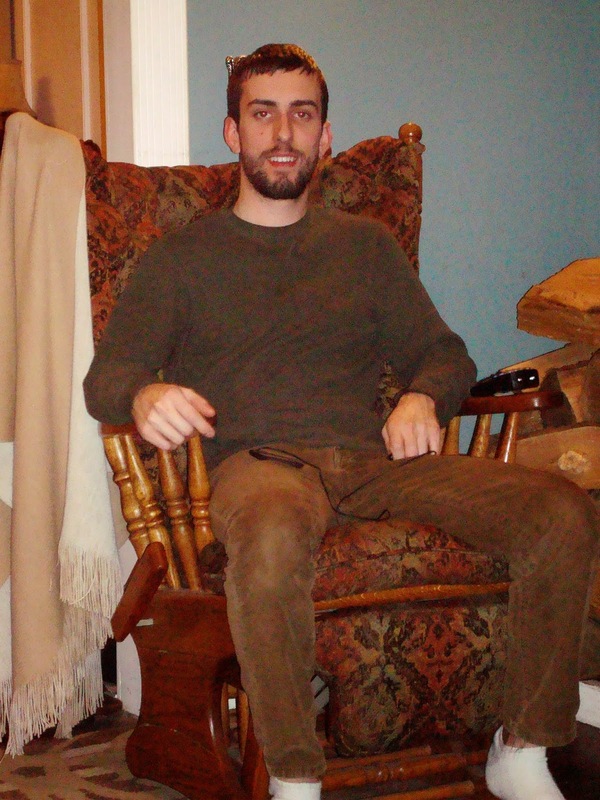 Here is my son Jordan reclining in my new rocker cushion. I guess rocking chairs aren't just for the elderly after all! And here is Ashley and Jason listening to my husband Todd speak who is standing above them. There was something about this Thanksgiving where I just felt unusually blessed and grateful. I usually hate holidays because they never live up to my high expectations and I'm always disappointed. But this Thanksgiving, my husband and I just felt so blessed with everything God has given us and has done in our lives and in our children's lives. We don't have many friends, and our extended family is distant and has different interests than us, but, we have each other. I've always wanted this big, happy, large, extended family where everyone loved and accepted each other and treated each other equally. I've always made holidays a bad experience for me, because no matter how hard I wished or tried, I could never have that happy extended family I so longed for. But this year, God showed me I already have that…in these four people here….for their hearts and love for me, for us, and for each other is so big, so vast, that it's larger than the biggest extended family out there. Thank you Jesus! What a wonderful post Amy, loved reading it! Your kids and hubby are so thoughtful, you received wonderful gifts, and who wouldn't love to wake up to such sweet birthday decorations! I am so happy to hear you had a great birthday Amy!! Happy Belated Birthday!! How sweet of your family to decorate for you!! What a treasure!! We had a small Thanksgiving but we too had a great time with each other just being thankful!! 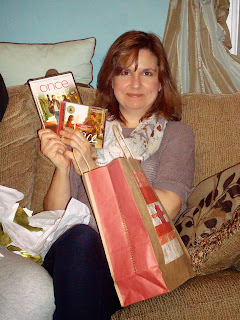 Wonderful post Amy, happy belated birthday and your Thanksgiving sounded marvellous and non hectic. Way to go!